The glass cutter has a rosette with 6 cutting wheels made ​​of special hardened steel, carbide steel, tungsten carbide or industrial diamond. With the glass cutter an evenly score is pulled on properly cleaned glass. So the glass (up to about 5 mm) can be broken easily. Basically you can make scores with every sharp material that is harder than glass. You can break it by placing the score on the edge of a table, or to slide a straight line or rod under the scratch, and exercise pressure on both sides of the scratch. Use gloves or cloths, the edges can be sharp. For small and narrow pieces you can tap under to the score, which sometimes causes a crack or deep scratch, and then you can break away the pieces with pliers. Very small pieces or rims, edges can be pulverized with pliers. A light wind is a tall, glass cylinder, sometimes with a bulge in the middle, and with two open ends. He is placed over a candle (or oil lamp) as protection against drafts and wind. Cutting the bottom out a bottle is also a possibility to create a candle shield or wind protector. Make (with clamps) a double guide. 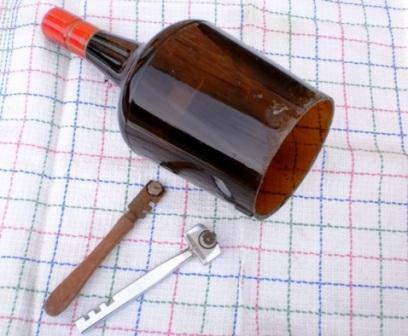 One on which you can press the bottom of the bottle while turning it around, and one spot to fix the glass cutter against the bottle to make the score. In this way, the beginning and end of the glass scratch normally come out on the same line. So in fact you cut the bottom with an edge (20 mm) from the bottle. Second option: mark the fault line on the glass. Soak a piece of string in gasoline or alcohol, optionally mixed with oil or grease to extend the fire duration. Tighten the string around the fracture line. Light it on a candle flame, and keep turning the bottle so the glass is everywhere (evenly) strongly heated. If the flame extinguishes you pop the bottle in cold water, so that the bottom piece jumps off. Not necessarily nice and right. Dripping hot water to heat the score should increase the success from 50 to +90%. Before using round the sharp edges with sandpaper, otherwise cuts are guaranteed sooner or later.